immediate reaction to a most masterful act of racism and propaganda – the Oscars… in 2001 it was black actors & professionals sweeping the boards whilst Iraq was invaded and now in 2009 the Indians win with ‘Slumdog Millionaire’ while Pakistan is bombed. *This film contains still images of physical violence. Domestic claustrophobia leads to violence. Will the tears come to an end? We have not placed the following two films in the public domain of the internet, at the request of the film-makers, due to the personally sensitive nature of their content. A Poetically succinct reflection on the bitter nature of racism. A romping, raw and honed performance piece Naomi Shoba looks into what underpins the sugary & the saccharine: nations sweethearts, nations sweatshops, 50 cents candyshop, push-up bras, our glorious leaders and more..
Q&A with director Jan Nimmo and a member of Edinburgh Chiapas Solidarity Group. 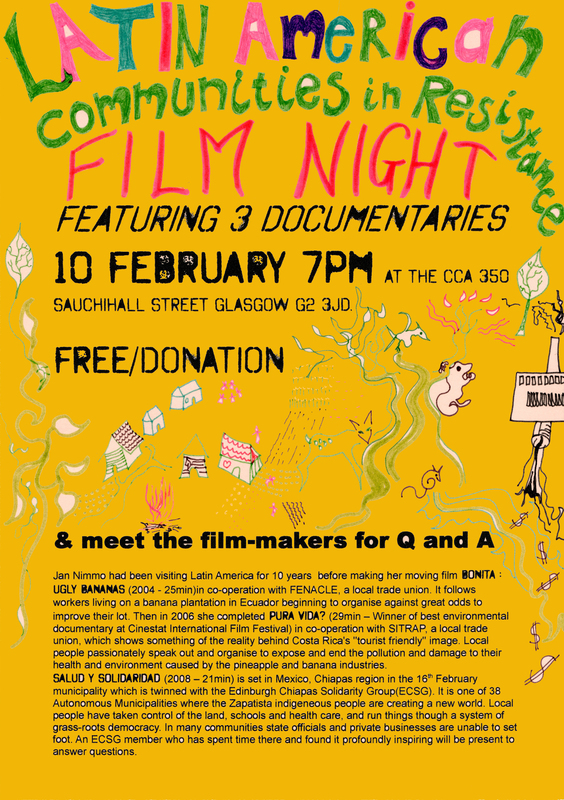 Jan Nimmo had been visiting Latin America for 10 years before making her moving film Bonita : Ugly Bananas (2004 – 25min) in co-operation with FENACLE, a local trade union. It follows workers living on a banana plantation in Ecuador beginning to organise against great odds to improve their lot. Then in 2006 she completed Pura Vida? (29min – Winner of best environmental documentary at Cinestat International Film Festival) in co-operation with SITRAP, a local trade union, which shows something of the reality behind Costa Rica’s ”tourist friendly” image. Local people passionately speak out and organise to expose and end the pollution and damage to their health and environment caused by the pineapple and banana industries. Salud y Solidaridad , made by the Camcorder Guerillas (2008 – 21min) is set in Mexico, Chiapas region in the 16th February municipality which is twinned with the Edinburgh Chiapas Solidarity Group(ECSG). It is one of 38 Autonomous Municipalities where the Zapatista indigeneous people are creating a new world. Local people have taken control of the land, schools and health care, and run things though a system of grass-roots democracy. In many communities state officials and private businesses are unable to set foot. An ECSG member who has spent time there and found it profoundly inspiring was present to answer questions.